There are a number of stories related to the vendetta of the Soga brothers against Suketune, the man responsible for the death of their father. This print by Gakutei illustrates one of those peripheral tales. 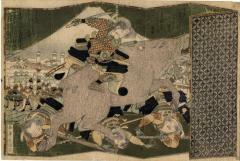 Yoritomo and his men, including Suketune, have gone to the foot of Mt. Fuji on a hunting expedition - where the Soga brothers are about to make their move. "During the... expedition, a monstrous boar, roused by beaters, killed some of its tormentors, threw others to the ground and then charged Yoritomo. Without the slightest hesitation, Nitan no Shirō placed himself directly in the beast's path, leapt on its back, and killed it with his dirk. to Shibayama on Mount Fuji. Source and quote from: Japanese Warrior Prints 1646-1905 by James King and Yuriko Iwakiri, p. 218. Illustrated in color on the next page. "In 1193, when the great warrior Yoritomo gave a hunting party at the foot of Mount Fuji, a boar suddenly broke cover and,wounded and maddened, headed straight at the hunters, too fast to be hit with their arrows. In an instant the warrior Nitan-no-Shiro Yadatsune sprang from Yoritomo's bodyguard and, casting aside his bow and arrows, and leaping on his horse, he made straight for the boar, which turned to attack him. Like a flash Nitan leaped on the back of the beast, with his own back to the animal's head. Grasping the tail, Nitan clung to the speeding animal until he found a chance to draw his dagger and stab him to death. Thereupon, so it is said, he received an ovation "so great as to shake the surrounding hills." "
Quoted from: The Asian Animal Zodiac by Ruth Q. Sun.